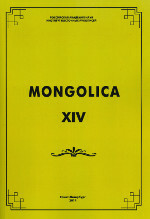 The 14th issue of Mongolica is dedicated to the 130th anniversary of the birth of the eminent diplomat, publicist, member of the Academy of Sciences of the USSR, scholar of Mongolian studies, specialist in ethnography, nomadic household, and Mongolian politics — Ivan Maiskiy (Jan Lachowiecki) (1884—1975). His work is a fundamental contribution to the study of the history, ethnography and political order of Mongolia. Written more than half a century ago, it has not lost its relevance today. Ivan Maiskiy dedicated most of his life to diplomatic service. His contribution to Mongolian studies is valuable as a description of Mongolia in the turbulent time of the country’s fight for independence in the early 20th century. This issue consists of the following parts: Historiography and Source Studies, Philology (Literature, Folklore, Linguistics), Reviews, Our Anniversaries, and Our Translations. The articles are written by both distinguished scholars and young researchers in the field of Mongolian studies. Reviews of new books make the issue topical. The papers are written in keeping with the research priorities of modern Mongolian studies, with special regard to the matters of history and culture of Mongolian ethnic groups, which gives the articles social, historical and practical value. The issue will be of interest not only to scholars of Mongolian studies, but also to specialists in philology, history and culture, as well as to those interested in the history of Mongolian ethnic groups and Central Asia. The article is devoted to the reception of Chinggisid political and legal traditions by the Oirat states (the Junghar Khanate, the Kalmyk Khanate, the Khanate of Tibetan and Kukunor Mongols). The author analyses the legal basis of the acceptance of the title «khan» by Oirat leaders, the processes of lawmaking and law enforcement, the formal substantiation of the claims of the Oirat states for the former domains of the Chinggisids. The author concludes that the Oirats often used Chinggisid political and legal traditions that, on their part, originated from the ancient Mongol state and legal experience, as well as examples of relations of Chinggisids with foreign suzerains. Key words: Turkic-Mongol law, Oirats, Junghar Khanate, Kalmyk Khanate, Chinggisids, khanate, legitimating of power, Buddhism. In 1331 in Novgorod a conflict between German merchants and local inhabitants took place. The situation is described in the report of the German Hanseatic merchants to Riga. The original letter is preserved. In the midst of the conflict a character from the group of «300 gold belts» intervened (German: CCC guldene gordele). According to historians and philologists, the mysterious «300 gold belts» is a figure of speech, or symbolizes the boyar elite of Novgorod in general. The problem is that the phrase «300 gold belts» is not mentioned anywhere else, and gold belts haven't been found in Novgorod excavations either. I suggest another hypothesis. The «300 gold belts» are the three hundred representatives of Uzbek Khan (1312—1341). The numeric designation indicates a group of elite, which is dominated by the Khan, the Khan being the one who bestows the belts. The practice of giving gold belts occurred at all the Mongolian courts. Gold military belts were the Imperial ritual — the only tool with which the Mongols lined up the power vertical. In Mongolian Iran there was a documented ritual of giving three hundred gold belts; in this case it deals with the representatives of the khan, in the position of authority. Thus, two indirect evidences (Mongolian Imperial ritual and numerous finds of gold belts) allow to insist that the «300 gold belts» is not a rhetorical figure, but a real institution. Key words: Novgorod, Hanse, «300 gold belts», Uzbek Khan, qurilta, palace ritual, XIV century. The author describes the collection of Buddhist finds from the settlement of Khara-Balgasun. These findings are kept in the Oriental Department of the State Hermitage Museum, they have not been studied or published. The finds are surface material collected by the expedition of V. L. Kotvich in August 1912. They can be dated to different times, one of them belongs to the Uighur time, the 8th―9th centuries, some other items can be dated to the 17th―19th centuries. Key words: archeology, findings, V. L. Kotvich, Buddhism, objects of Buddhist cult, the State Hermitage. The Epic of King Gesar (Geser Khan in Mongolian, Buryat, Oirat versions) is the largest epic of the peoples of Central Asia, the favorite epic story of the Tibetans, Mongols, and Buryats. Based on a Tibetan version, it has also developed in the folklores and literatures of Mongolian-speaking, Turkic and other peoples, and continues to develop to these days. One of the most ancient Tibetan versions of the Gesar-epic is kept in the collection of the Russian National Library (St. Petersburg, Russia). This manuscript was brought by G. N. Potanin at the end of the 19th century from North–Eastern Tibet. It was first described, partially translated and studied by the Mongolian academician Ts. Damdinsuren in the middle of the 20th century. In 2013, we published an article on the second chapter of the manuscript. This paper deals with the description of the Tibetan version of RNL, the history of its study, and the fifth chapter about the war against the Hor people from the second part of the manuscript. On the basis of our translation of the chapter, a preliminary literary–linguistic analysis was conducted, which allowed to make a number of conclusions: 1) The manuscript is written in Ume and Uchen scripts and has a prose–poetic structure that contains a significant amount of proverbs and sayings, comparisons, metaphors and toponyms. 2) The language of the manuscript is close to the spoken Tibetan language, but the manuscript is not a record of the oral tales. 3) It is possible that the theme of «The murder of the beast from the inside» told in the Tibetan manuscript of RNL has developed into a whole chapter about the murder of a tiger in the Mongolian versions. 4) The text of the manuscript has experienced a definite influence of Buddhism. Key words: Gesar, Geser; Tibetan epic, folklore, literature, language, toponyms; Mongolian, Buryat, Oirat epics; Russian National Library. The Article is devoted to the international folklore and ethnographic expedition to the Khuvsugul aimag of Mongolia in August 2011, and examines the texts, traditions and rituals associated with the “mythologem of the way”. Key words: the Mythologem of the way, sacred space, shamanism, myths, legends, tales. This article explores the pantheon of deities in the Buryat mythology associated with the cult of the sky. In comparative terms it is considered to be an epic interpretation of the world of the gods, contained in the heavenly prologue to the epic «Geser». The author concludes that the Buryat sacred tradition has preserved many elements of the ancient Mongolian people’s axiological foundation. This article is of interest to folklorists, anthropologists and scholars of cultural studies. Key words: pantheon, mythology, sacred tradition, the heavenly prologue, Epic of King Gesar, the cult of the sky. The article is devoted to the study of the biography and works of one of the masters of St. Petersburg Buddhist temple, the Buryat artist and philosopher Geleg-Jamtso Tsebegiin. He is known as a man of great learning, an ordained lama, the author of several works on Buddhist astronomy and mathematics. In the article the role of G.-J. Tsebegiin in creating the temple decoration of the datsan in St. Petersburg, is emphasized. He largely contributed to the construction and decoration of the main altar of the datsan. The author also analyses G.-J. Tsebegiin’s manuscript “Maudgalyaana in hell” of the first half of the 20th century from the collection of the State Museum of the History of Religion, its system of composition, colour, and the manner of painting. Key words: Tibet, Mongolia, Buryatia, Buddhism, art tradition, the Saint-Petersburg datsan, G.-J. Tsebegiin. It is generally accepted that Chinggis khan's father was Yisügei ba'atur. Most of the Mongolian accounts support this idea, but other answers to this question also emerged. As the Mongols’ way of thinking changed, other figures were also brought up who were regarded as the great khan’s father. Vajrapani and Qormusda were also mentioned as his father, but in several cases the identity of Chinggis’ father was irrelevant. The reason for this is that the descendants traced back their power and legitimacy to Chinggis, not to his father, and they wanted to emphasize the illustrious origin of the Great khan. Key words: Chinggis khan, Yisügei, Mongolian historiography.